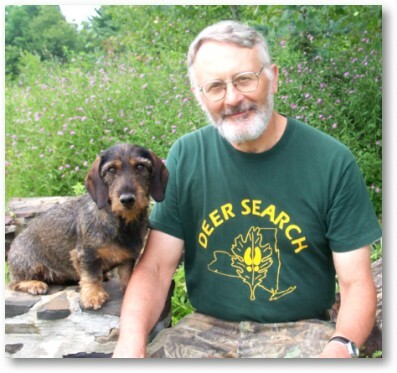 John Jeanneney, author of book "Tracking Dogs for Finding Wounded Deer"
Wearing many hats - John Jeanneney - is a hunter, tracker, dog trainer, breeder of hunting wirehaired dachshunds, author of many articles on blood tracking, speaker at numerous workshops and seminars, educator and scholar. He began tracking wounded deer with dogs in 1976 after he had been granted a research license from New York State’s Department of Environmental Conservation to investigate the feasibility of using leashed tracking dogs. John has kept careful records on over 750 deer calls, which he has taken himself. His understanding of the art of tracking was enriched by the experiences of other trackers around the country and above all by his fellow trackers in Deer Search, an organization that he co-founded. As an American hunter who has read much of the European literature on blood tracking, he believes that we need our own book, written in our own language, to deal with tracking problems that are unique to America. This is what compelled him to write this book. John has retired from his University position as a history professor and now he resides with his wife Jolanta and a dozen of wirehaired dachshunds in Berne, located in the Helderberg Mountains of New York State. John Jeanneney with his blood tracking dachshund Elli. This is the first book in the English language to explain how a trained dog can be used to find wounded deer that would not be recovered by other means.